I was in process of researching info for my Wild Magic workshops when I was guided by them up there to return to the vision that first started my relinking with this realm and here are the results. I was shown the Goddess lying pregnant, in a dark glade from the mound of her belly sprouted the seedlings of the mighty oaks that one day cover the sacred isles and form the ancient groves of the Druids. I watched as the birth pangs of the Goddess, released many things, some wonderous, some dark. I heard ‘in reality the birthing process is neither, clean,neat nor sterile’ and so the bodily wastes where confined to their own space. Each birthing breath released bubbles of energy, which swirled and seperated into united entities,Earth, Water,Wind and Fire. There was joyous laughter as each formed and took shape. From out of the shadows came a troopof small people, beautiful of face and fine boned, joyous, laughter filled beings.They sort of shimmered into being, more than walked, it was more like a disturbance in the air and they were there. These were the birth attendants to the Goddess and she gurgled with laughter at their appearance. Some sang sweet haunting melodies, songs of the stars and planets. Some played music that made you want to weep and laugh and shout for joy all at the same time. Many women danced in intricate spirals around the Goddess. Older women attended the Goddess, wiping her brow with mosses and fragrant oils while others gently, rythmically massaged her massive belly. Men stood in a circle facing outwards, their voices raise to the heavens, calling in the presence ofthe Father God. Voices that shook the heavens and made the stars dance in reflection of the pattern woven by the women dancers. The waters of the Goddess broke in a surge of rainbow light, so bright it was temporarily blinding. When sight returned, the Goddess lay smiling, surrounded by all the earths creatures, real and mythical.The dark glade was now green, fertile, and covered in flowering vines of all sorts and the perfume was overwhelming. Resting within her arms, a male and female child, twin flames of light shining from their eyes. Milk ran in streams from her volumptious breasts and caused rivers throughout the land. Her blood soaked deep into the earth beneath her. The Goddess had birthed humanity, the people of Fae the midwives. Those who had walked beside her before time as we know it. From this ‘vision’ I understand the Fae, are indeed a special race. For they walk closer to the Goddess energy than any other. So it is humbling to be allowed to work beside them. 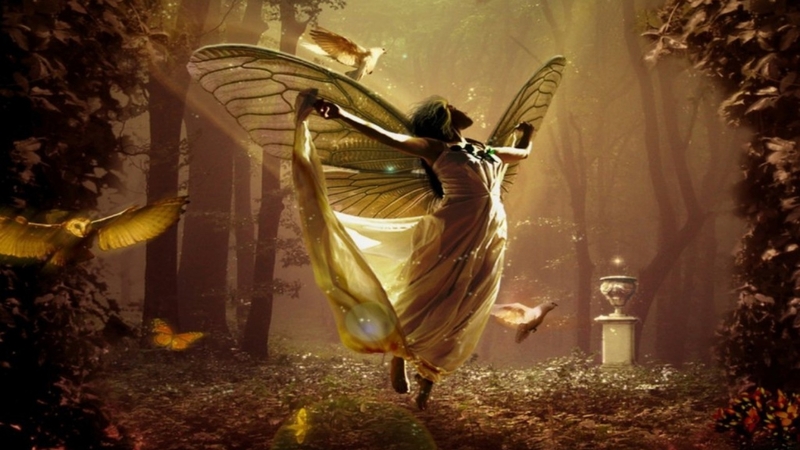 I would like to be instrumental in lifting up the image of fairies, from the light, fluffy, conception many hold today. so that we may understand and share the wisdom of the Elder race. These, the teachers of herbal lore, The masters of music.They truly are a magical race and as many worlds and people have retreated ‘beyond the mists’ or ” beyond the veil”, I have been given the knowledge that these elder folk have withdrawn their presence from this dimension. However, they can and do cross at will. Some of us in fact carry traces of the elder blood. Our ‘fairy stories’ and mythology ,often refer to the fairy links or people who took human form. In reality, they simply adjusted their dimensional form so to be visible in human reality.Look to the legends and you will see the truth of the elder folk.And so I will be looking deeper into the elder folk, as I am certainly intriqued.